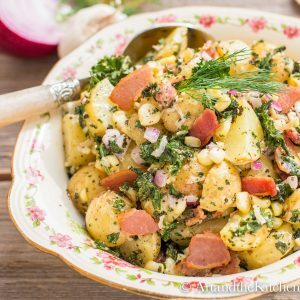 Old fashioned potato salad got a tasty update with some Kale! Bacon Kale Potato Salad is delicious. I can hardly wait for summer to get here! Green grass, flowers blooming, fresh produce growing in the garden and of course barbecue season! 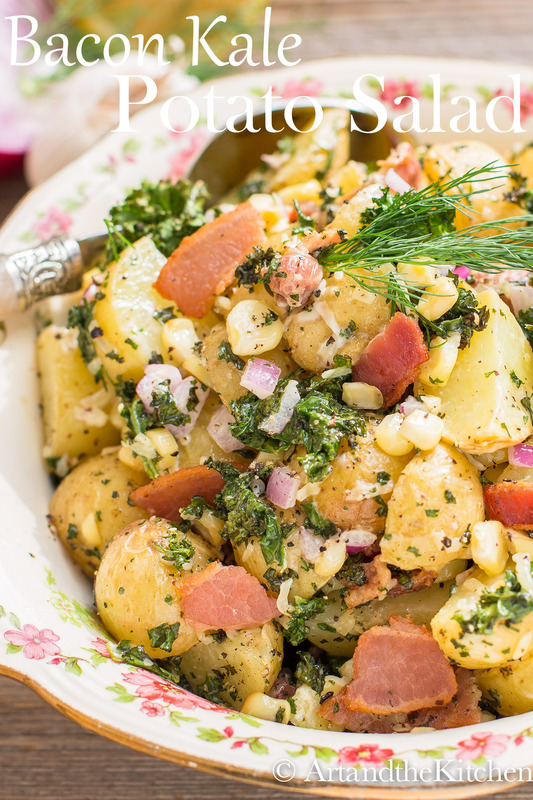 An all-time favorite dish to bring to any summer gathering is Potato Salad. 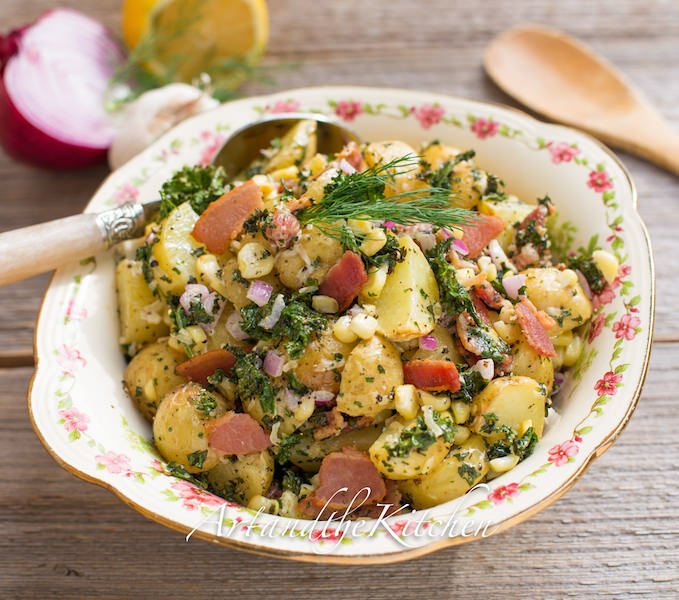 This recipe for Bacon Kale Potato Salad has a flavourful twist. My husband’s family love their potato salad with an oil and vinaigrette dressing, mine love their with good old mayonnaise dressing. Then there comes to choice of what to add – eggs, radishes, pickles, onions? For my potato salad recipe I decided to add kale, bacon and corn. I love Irish Colcannon, so I decided since kale tastes so yum in Colcannon, why not potato salad. This recipe tastes fantastic warm or cold! 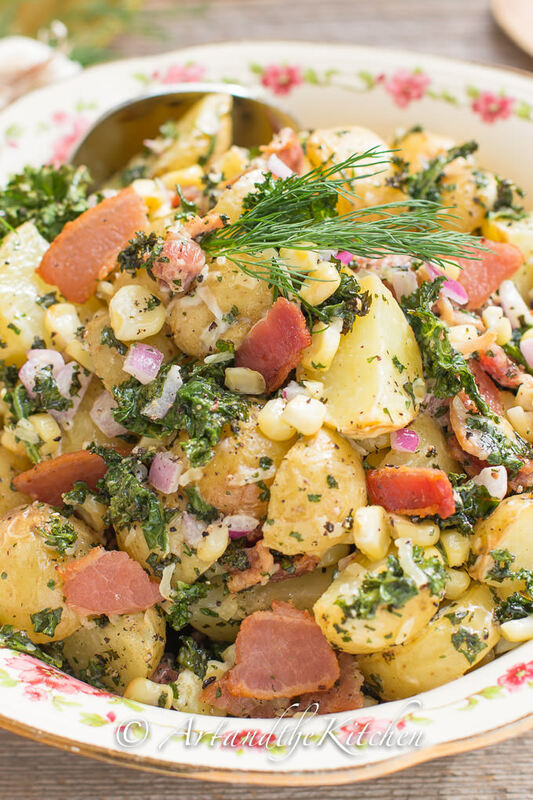 A tasty twist on potato salad with kale, bacon and corn. In large bowl, toss together potatoes and olive oil. Spread potatoes and garlic cloves (unpeeled) on to cookie sheet lined with foil. Bake 30 minutes or until tender, stirring occasionally to brown all sides. While potatoes are baking fry bacon until crisp, cut into pieces. In separate skillet melt butter, add kale and cook over medium heat until kale is tender and turns vibrant green. In medium size bowl mix together, parmesan cheese, red onion, mayonnaise, sour cream, lemon juice, fresh dill, cover and refrigerate until potatoes are done. 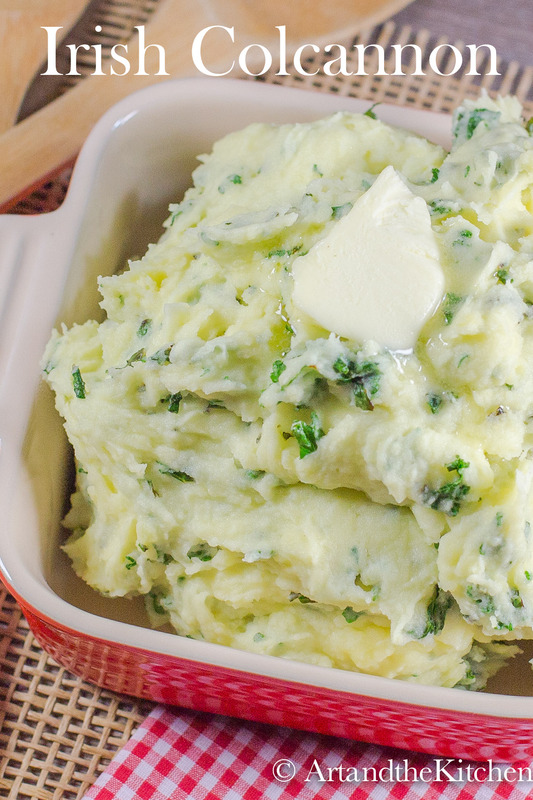 When potatoes and garlic are done - remove skin from garlic, mash and stir into dressing. 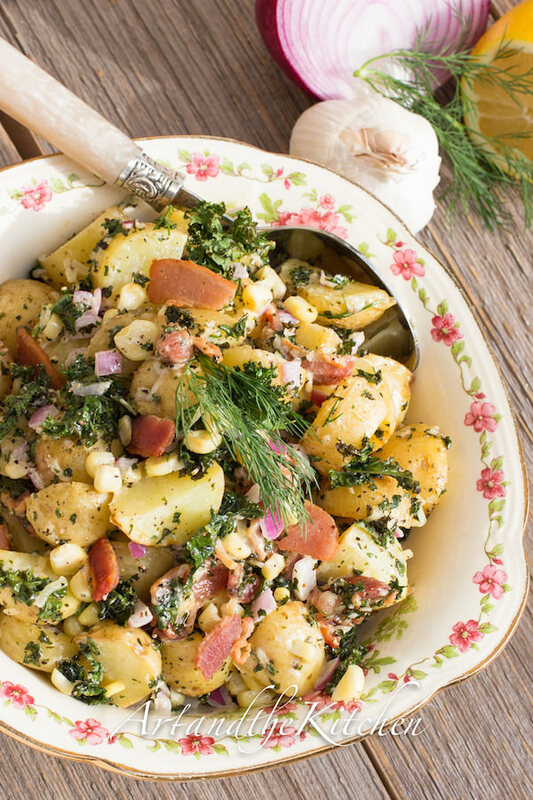 In large bowl combine together potatoes, corn, bacon and kale. Stir mayonnaise dressing into potatoes and combine well. I made this for a picnic, it was EXCELLENT. I love all your delicious ingredients in this potato salad. Sounds like a meal to me!